In terms of value, updated bathrooms aren’t just a great selling point — they’re also a great staying point. 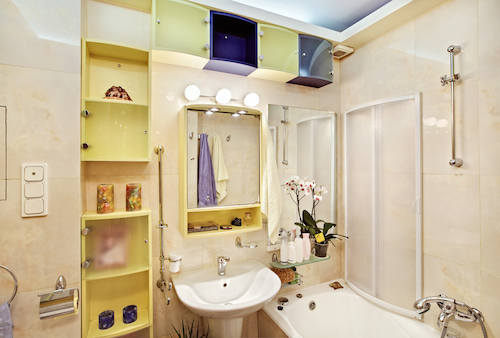 When you take the time to update your bathroom vanities, bathtubs, lighting and other fixtures, you just may want to stay in your home for a longer amount of time. That’s why — whether you’re planning to put your home on the market soon or are just looking to find more enjoyment right where you live — a bathroom remodel can be a great choice. The only problem? Remodeling can get expensive. Avoid layout changes. As fun as it might be to completely re-arrange the floor plan of your bathroom, if it’s possible to keep things where they are, do it. Reworking plumbing, electrical outlets and wall/floor openings are major remodeling projects, which create bigger expenses. To make your remodel more cost-effective, don’t change the layout. Use what you have. One of the biggest ways to cut costs in a bathroom remodel is to repurpose or fix an element you already have instead of replacing it with a new option. Instead of ripping out the brown tile floors and replacing them with new ones, for example, could you paint the floors with a few fresh coats of white? Instead of fully tiling the entire bathroom, could you tile only the shower and just repaint the rest of the space? Look for ways to repurpose or rework the vanity you already have, maybe with a new faucet or new hardware, for example. Upgrade the showerhead instead of redoing the entire shower, if possible. Get the tub refinished instead of replacing it outright. Any decision that allows you to keep using the features you have is a decision that helps your bathroom budget. Seek discounts. Shopping around is a great way to cut costs on a remodeling project, especially when it comes to the bathroom. One of the best ways to do this is to look for a supplier like Modern Bathroom, where everyday prices are up to 70 percent less than they are elsewhere. Likewise, you can buy a used dresser to repurpose as a vanity. Try to find a less popular granite color or style. Inquire about slabs with imperfections, which may be offered at a lower rate. When it comes to the shower, opt for a prefabricated model instead of painstakingly tiling one yourself. Do it yourself. While DIY projects aren’t for everybody, they are an excellent way to cut remodeling costs. What parts of your project can you handle on your own? Instead of hiring painters, can you repaint yourself? Instead of hiring a plumber to swap out the toilet, can you buy one and replace it yourself? Be willing to take on small tasks, and you can shrink your bathroom budget. Prioritize. Sure, heated floors and a walk-in shower would be cool features, but, when your budget is tight, try instead to prioritize what you change. Evaluate what’s most important to you in the bathroom and focus on those components. Ample lighting is always a good bet in terms of overall appeal. Pick eco-friendly features. While eco-friendly bathroom features can be more costly upfront, they often pay for themselves over time through the money they save. Look into water-saving toilets, eco-friendly bathroom materials, etc. Upgrading your bathroom is a worthwhile project, not just for resale value, but also for your quality of life. If you’ve been thinking about taking on a renovation project, don’t let budget worries keep you from moving forward! Use the tips above to plan your project and create the kind of space you — or a potential buyer — will be sure to love. By renovating strategically and cost-effectively, a newer, better bathroom is entirely possible. Are you ready to breathe new life into your powder room? Wondering how you can upgrade your half bath to make the most of its small space? Whether you’re renovating for resale value or just to find more enjoyment in your home, upgrading a half bath involves a variety of decisions. From thinking about style to shopping for bathroom sinks, here are some key tips to keep in mind on your project. It’s hard to go wrong with a neutral color palette, whether it’s in the half bath or elsewhere in your home. Nonetheless, if you’ve wanted to experiment with a bold color, the small half bath could be a great place to do it. Just be careful not to overdo the experiment — keep accessories and decorative accents to a minimum to avoid a cluttered feel. Other design elements that work well in a small bath include pedestal sinks to free floor space, open shelving to improve storage, pocket doors and/or mirrored walls to trick the eye into seeing the space as larger than it is. If you’re fairly handy and comfortable with basic remodeling projects, doing upgrades yourself can be a great way to cut costs. At the same time, if you are new to remodeling and/or unsure of what you’re doing, you could unintentionally hike costs by creating problems a professional has to repair. Think through the upgrades you want to make and figure out what you can or can’t handle. Maybe putting in new bathroom faucets is doable, while upgrading to vessel sinks requires a professional — the choice is yours. Before you buy new sinks or tile, stop to pinpoint your project’s budget. Even when it’s a small half bath, costs can vary widely, from a few hundred dollars for a feature or two to thousands of dollars spent gutting the bath. What will you change? What can you afford? Determine this before moving forward. For many homeowners, a top priority in a half bath remodel is finding ways to make the small room feel bigger. If this sounds like you, try picking sinks in proportion to the room rather than oversized sinks that take too much space. Likewise, when maximizing size is a priority, skip the bold color choices and opt instead for neutrals, with a few pops of color here and there. Minimize knick-knacks and keep the room clutter-free. 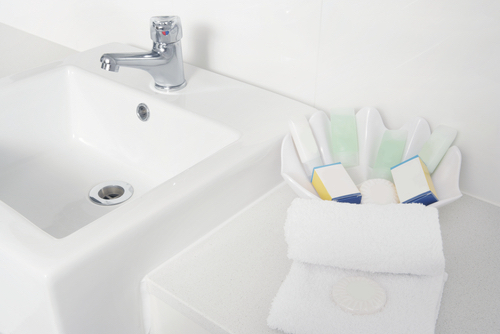 Choose smaller sinks, toilets, etc., in order to keep space available. Think strategically about spacing in the half bath to make it feel bigger than it is. If your layout and budget allow, here are some cool ideas that are currently popular in upgraded half baths: skylights, eye-catching floor tile, statement sinks, wainscoting or floating sinks. Explore these possibilities to see what might work for your room! Making the most of a remodeling project means knowing what mistakes to avoid. To give your project the best results, avoid these blunders: trying to DIY something you don’t know how to do, buying fixtures that are too large for the space, replacing items you could repair, or fix for lower costs or overfilling the room with decorative debris. Remodeling projects can get expensive, but with a little creativity, you can cut costs. Instead of buying the first sinks you see, for example, shop around. Look for a supplier like Modern Bathroom that offers everyday low rates. Consider slightly imperfect countertop slabs that are offered at discounted prices. Instead of replacing everything in the existing powder room, see what you can repurpose or rework to cut costs. When it comes to bathroom remodeling projects, Modern Bathroom is your top resource. We have two showrooms in California and a huge catalog online. Thanks to our free shipping and low price guarantee, it’s easier than ever to get quality bathroom products to your home conveniently. 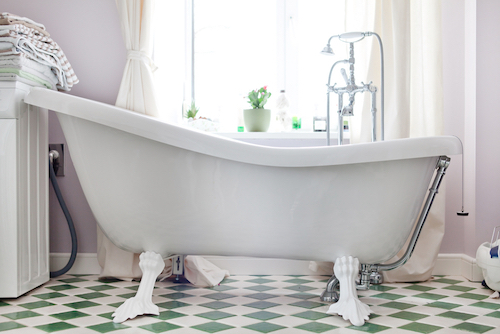 Shop for the best in toilets, vanities, showers, tubs and more! Shop now — or contact us with any questions! What Makes The Perfect Guest Bathroom? Guest bathrooms are often one of the last places of your home to see updates. 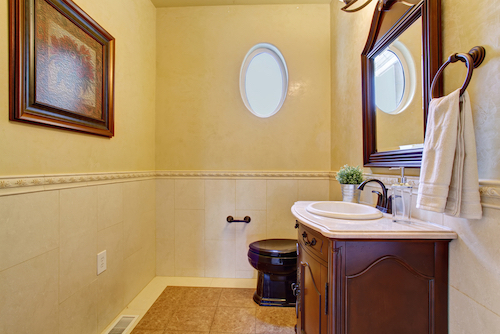 Rarely used by the household, guest bathrooms are typically small and uninviting. However, these bathrooms are an excellent opportunity to wow guests and up the ante when it comes to design. Employ the following techniques to create the perfect guest bathroom in your home. Typically, guest bathrooms are small. Although your guests’ time in your bathroom is expected to be brief, there is no reason why they should be uncomfortable. When you update your bathroom, strive to increase the space. You can do so by incorporating a closet, cabinets, or taking space from another room. Even a few feet of space can improve the level of comfort your guests experience when using your bathroom. Over the years, the industry standard has changed drastically when it comes to shower enclosures. Although the bathtub/shower combination was great for saving space, the design was lackluster. Modern shower enclosures are often separate and bigger. Additionally, glass is the most popular option for shower enclosures. Glass is an attractive choice because there are a plethora of modern styles to choose from. Plus, it’s easy to clean and rust-free. Even though many people prefer a shower instead of a bathtub, it’s important to give them the option. One of the biggest trends is including a freestanding tub in a spa-like shower enclosure. With the option to soak during a visit, you can help your guest alleviate stress. Updated fixtures in a guest bathroom have the ability to transform the look and feel of the room. You can completely change the look of your guest bathroom by incorporating a new bathroom faucet based on your choice of metal, including polished nickel, sterling or oil-rubbed bronze. Although updated fixtures may seem like a simple strategy, this minor tweak can infuse life in smaller bathrooms. Bathroom design is all about what you see. If you need more space, but don’t have any way to incorporate physical space, you can use the lighting in your bathroom to make your room seem bigger. Layered lighting adds texture in your bathroom, and it creates a soothing feeling. To get the most out of your lighting, install sconces, leverage natural light from a window, and use recessed lighting. Once you’ve enhanced your lighting, consider bold mirrors, a popular trend this year. Oversized mirrors hanging over pedestal sinks give your guests a quick way to check their look. Additionally, these mirrors also help to reflect the lighting, making it appear as if you have more lights in the bathroom. At Modern Bathroom, our goal is to help take your guest bathroom to the next level. We are the premier source for stylish and high-quality bathroom shower enclosures, faucets and accessories. If you want to wow guests with your bathroom design and layout, make Modern Bathroom your one stop.